Opino igual que tu en cierta parte, no veo justo que una persona que llego a donde esta gracias al beisbol venezolano despues de que esta en la cima lo denigre, pero digo que estoy de acuerdo en cierta parte, porque vizquel tambien hizo un comentario al beisbol venezolano diciendo que el no venia a jugar mas para aca porque el beisbol venezolano no servia, luego el vino a despedirse simplemente fue para pedir perdon por el comentario que habia dicho que lo criticaron muchisimo..
:smile:Andres aunque ese no fue tu mejor año,para mi eres lo MAXIMO.Sigue cosechando exitos suerte en tu nueva carrera como comerciante.EXITOSSSSSSSSS. Saludos, Josmar parece que estaba pequeño cuando OMAR VIZQUEL declaro a la prensa que “no jugaria en los campos venezolanos por estar en malas condiciones” y no Andrés Galarraga como el afirma; eso causó polemica y hay mucha evidencia de esas declaraciones en la prensa de la época. Es cierto Josmar, esas palabras sobre el mal estado de los campos fue dicho por Omar y no por el gato quien se caracteriza por verdadera humildad. 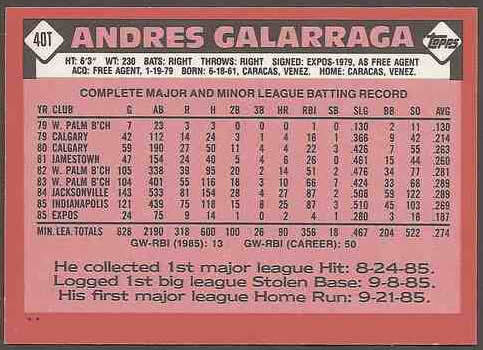 La carrera de Andrés Galarraga en el beisbol, me parece una de las más “románticas” por todas las cosas que hizo y por otras que vivió, por supuesto que todos conocemos su record de 47 jonrones con los Rockies (sin esteroides, antes de los Mc Gwire, Sosa, Bonds, Canseco, etc.) 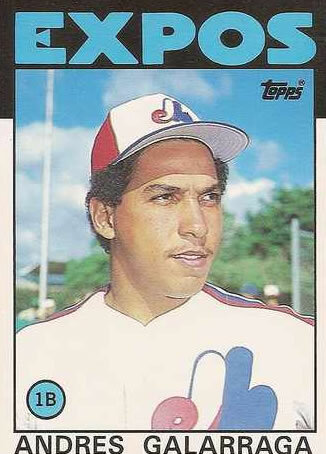 y las 150 carreras impulsadas, después que San Luis lo desechó como bateador, lo rescató un iluminado del beisbol como Don Bailey para cambiar su mecánica de bateo; pero en todo caso me parece una persona ejemplar en aquello de la humildad y la perseverancia, además de la paciencia y como lo decía Héctor Cordido en estos días: es el jugador de beisbol más carismático de Venezuela, no creo que haya alguien a quien no le caiga bien. Lo único negativo fue no verlo jugar más en Venezuela durante al menos una temporada antes de su retiro y el no haberse creido con la convicción suficiente para llegar a los 400 jonrones en las grandes ligas. Pero lo bueno dentro de lo malo: quedó con 399 cuadrangulares, lo que confirma una vez más su humildad y su sinceridad para con él mismo, demostrando que había cosas más importantes que llegar al club de los 400. Que Dios lo bendiga, siempre tendrá mis respetos y mi admiración, sin duda será el amuleto de buena suerte para los vinotintos en el clásico mundial de beisbol. De cuaquier modo, los Leones del Caracas retiraron su camiseta Nº 41 en honor a sus méritos. No se descarta que en un futuro pueda ser coach del equipo. Youre so right. Im there with you. Your weblog is definitely worth a read if anybody comes across it. Im lucky I did because now Ive received a whole new view of this. I didnt realise that this issue was so important and so universal. You certainly put it in perspective for me. Dude, please tell me that youre going to publish much more. I notice you havent written an additional blog for a while (Im just catching up myself). Your blog is just also important to become missed. Youve acquired so very much to say, such knowledge about this topic it would be a shame to see this blog disappear. The internet needs you, man! Hey – nice weblog, just looking around some blogs, appears a pretty nice platform you are utilizing. I’m currently using WordPress for a couple of of my websites but looking to change 1 of them more than to a platform similar to yours like a trial run. Something in particular you’d suggest about it? Just a fast hello and also to thank you for discussing your ideas on this web page. I wound up in your weblog right after researching physical fitness connected issues on Yahoo… guess I lost track of what I had been performing! Anyway I’ll be back once again inside the long run to examine out your blogposts down the road. Thanks! Hey, I stumbled across your blog through Msn and just wanted to say that I really like it. I’ll definitely be bookmarking it! This was a actually extremely beneficial post. In theory I’d like to create like this also – getting time and actual effort to make a good piece of writing… but what can I say… I procrastinate alot and by no means seem to obtain one thing done. Amazing! It is like you understand my mind! You seem to know so much about this, like you wrote the book in it or something. I think that you can do with some pictures to drive the message home a bit, but other than that, this is wonderful blog post. A good read. I’ll certainly be back. Good job right here. I truly enjoyed what you had to say. Keep heading because you definitely bring a new voice to this subject. Not many people would say what youve said and still make it interesting. Well, at least Im interested. Cant wait to see more of this from you. I think youve produced some really interesting points. Not too many people would actually think about this the way you just did. Im truly impressed that theres so a lot about this topic thats been uncovered and you did it so properly, with so substantially class. Good one you, man! Seriously terrific things right here. This was a truly incredibly superior submit. In theory I’d prefer to publish like this also – getting time and actual effort to make a fantastic piece of writing… but what can I say… I procrastinate alot and by no means seem to obtain anything done. This is simply awesome. I am definitely going back to this site. You are not the regular blog writer, man. You definitely have something important to add to the World Wide Web. Such a outstanding blog. I will come back again for more. Hey – good blog, just looking around some blogs, appears a pretty nice platform you are making use of. I’m currently using WordPress for several of my web sites but looking to change one of them around to a platform similar to yours like a trial run. Something in specific you’d suggest about it? said here tells us the reality of the situation. Thanks for your insight, i really like finding articles that educational helpful in nature. Hey, cool site. I came across this on Yahoo, and I am stoked that I did. I will definately be returning here more often. Wish I could add to the conversation and bring a bit more to the post, but am just absorbing as much info as I can at the moment. While this subject might be quite touchy for most people, my opinion is that there has to be a middle or frequent ground that we all can find. I do appreciate that youve added related and intelligent commentary the following although. Thank you! Great site here. Many blogs like yours cover subjects that just aren’t covered by magazines. I don’t know how we got on 10 years ago with just print media. you if it’s allright. Could it be only me or do a few of the remarks look like they are coming from brain dead visitors? :-P And, if you are posting at additional online social sites, I would like to keep up with you. Would you make a list of all of your shared sites like your linkedin profile, Facebook page or twitter feed? reader. What could you suggest about your submit that you simply made some days ago? I do believe all of the ideas you’ve offered on your post. They are very convincing and can certainly work. Still, the posts are very short for beginners. May just you please lengthen them a little from next time? Thanks for the post. find it very bothersome to tell the reality on the other hand I will certainly come again again. The clarity for your publish is just cool and i could think you’re an expert on this subject. Fine together with your permission let me to take hold of your RSS feed to keep up to date with impending post. his project. I honestly think that he is unstoppable and will figure it out. by just one company to make it unaffordable. trick. In addition, The contents are masterpiece. you have performed a great job in this matter! I definitely enjoyed every bit of it and i also have you saved to fav to check out new things on your website. stores and navigating to the online site. These are within a specific period for a specific product. to first place in the shop. Natural treatment for acne are preferential as a result of many concerned parameters. to think regarding before selecting a acne treatment. Then they are cheap and inexpensive in comparision with other medications. I read this post completely regarding the difference of newest and preceding technologies, it’s awesome article. Mountain Hardwear displayed a new glove, the Minus Zero, that is a great do it all piece. Have you ever considered about incouding a little bit more than just your articles? but with pics and video clips, this blog could certainly be one of the best iin itts niche. It’s amazing to pay a quick visit this site and reading the views of all mates about this paragraph, while I am also keen of getting familiarity. viewers for setting up new webpage or even a blog from start to end.